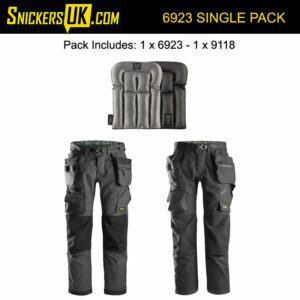 Snickers Floorlayers Trousers are now available in two styles. The traditional 3223 and the latest 6 series style 6923. Both garments are perfect for fitters who spend 80% of the day on there knees. Please see below for sizing advice. Save your knees in these advanced FloorLayers trousers and count on reliable protection and functionality for every working day. They feature an innovative cut for a perfect fit as well as coated Kevlar® reinforcements on the knees for extra durability.